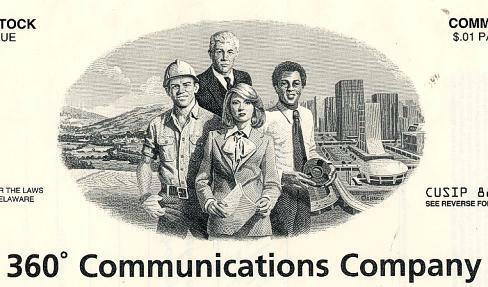 Beautiful certificate from the 360 Communications Company issued in 1996. This historic document was printed by American Banknote Company and has an ornate border around it with a vignette of a group of company employees. This item has the printed signatures of the Company's President and Secretary and is over 16 years old. 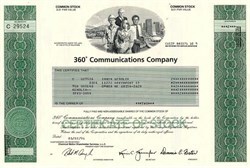 360networks offered optical network services to telecommunications and data communications companies in North America. The company�s optical mesh fiber network spans approximately 40,000 kilometers (25,000 miles) in the United States and Canada.